Traveling back in time, where holiday attire meant elegance. Our icon Alan Delon has the perfect relaxed, yet gentlemanly look, reflecting on the collection’s silhouettes. Colors are bright and playful, and holiday-inspired graphics look to the mandatory tiki bar at the old, exclusive resorts. West Bay Linen Blazer, West Bay Linen Pants and Paradise Shirt. Cape Blazer, Matira Shirt with Classic Oxford Shoes. La Concha SS Shirt, Cape Suit Pant with Classic Oxford Shoes. Akajima Pique, West Bay Linen Shorts with Chunky Mats Suede Sneakers in Navy. West Bay Linen Blazer, West Bay Linen Pants, Paradise Shirt with Classic Oxford Shoes. 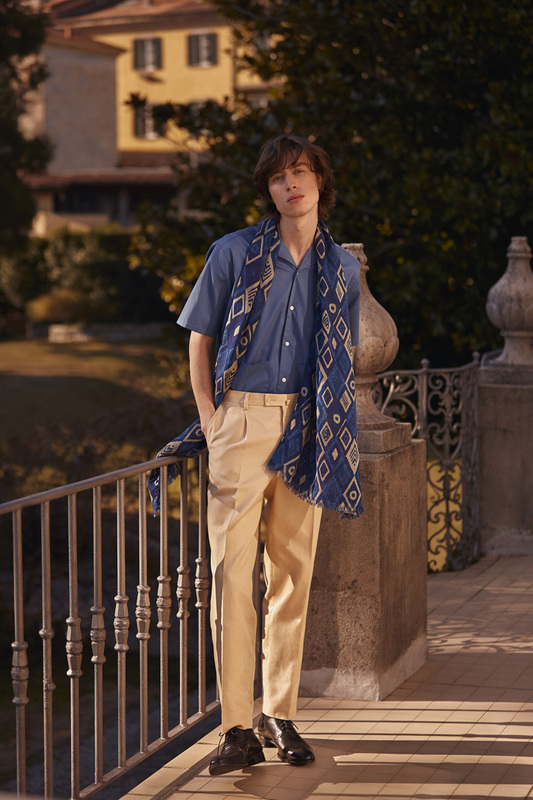 Tulum SS Shirt, West Bay Linen Pants, Los Scarf with Classic Oxford Shoes. Navaggio Shirt and West Bay Linen Pants with Classic Oxford Shoes. Champagne V-Neck Knitted Sweater and West Bay Shorts. Champagne V-Neck Knitted Sweater, West Bay Shorts with Mats Leather Sneakers in White. Pulau Pyjamas Blazer, Lenny Polo Sweater and West Bay Linen Pants. Balos Shirt and Pulau Pyjamas Pants.